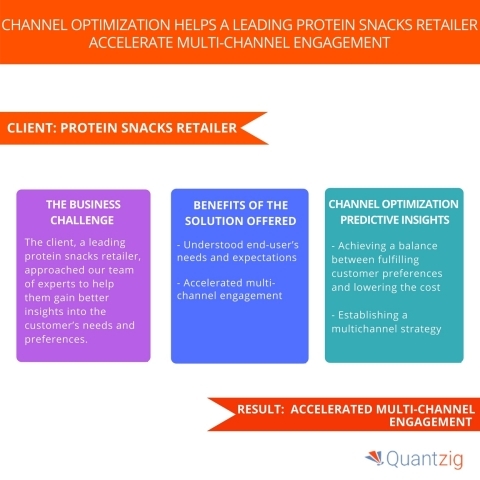 LONDON--(BUSINESS WIRE)--Quantzig, a global analytics solutions provider, has announced the completion of their latest channel optimization study on the protein snacks retailing market. A leading protein snacks retailer wanted to predict the future industry trends and build strategies to increase customer retention. Protein snacks such as snack bars provide high nutritional value and suitability as they can be consumed between meals while traveling or during workouts. Snacking, protein and wellness are the top three US food trends. These trends drive the growth of the protein snacks market. Protein snacks were mainly found in stores, but due to such trends, they have made their way into the mainstream. Book a Solution Demo to see how Quantzig’s solutions can help you. The channel optimization solution presented by Quantzig helped the client to gain better insights into the customer’s needs and preferences. The client was able to determine meaningful channel usage patterns to help them make informed decisions. The client wanted to gain better insights into the customer’s needs and preferences.